Or view larger version. "California Gold Diggers - A Scene From Actual Life At The Mines". Date unknown. Ballou’s Pictorial Drawing-Room Companion. Drawing on paper. Collection of Oakland Museum of California. 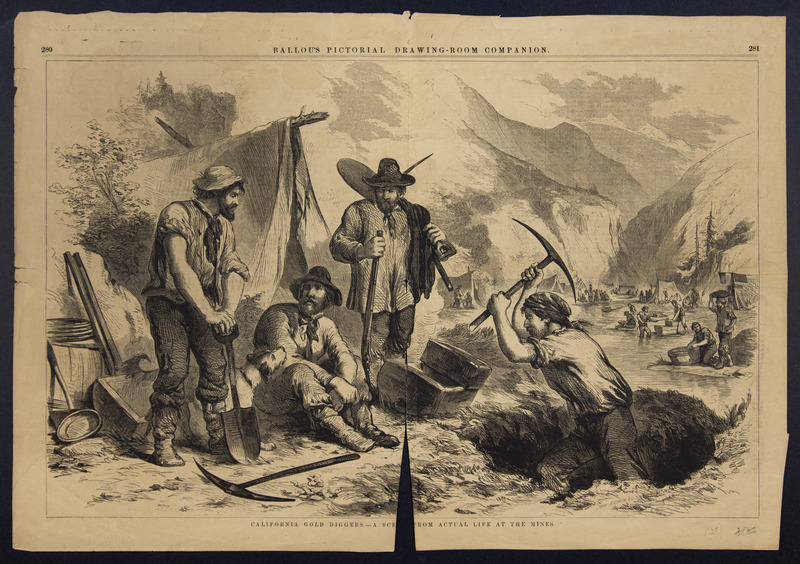 This is a drawing of gold miners at the diggings. The term, “diggings” means an excavation site for digging or mining ore, metals or precious stones. In this case, the miners are digging for gold. Mining gold was hard, monotonous work that was mostly unrewarding. It combined, one miner said, "the various arts of canal-digging, ditching, laying stone walls, ploughing and hoeing potatoes."